Have you ever been so engrossed in a book that the world goes on around you without you even noticing? Me too! They don’t need to be the most well-written, highbrow stories in the world. They still have the power to draw you in and keep you turning the pages, long after you should have gone to bed, cooked the dinner or caught that train. Here are my top 5…. I stayed up way too late to finish this book. I couldn’t help myself; the pace runs away with you and by the time you get halfway in, you’re so wrapped up in the characters and rooting for them that you know you have no choice to stick with them til the end! This is the first of a mammoth series of 15 books set in an alternative Celtic fantasy universe. I didn’t read them all in one sitting, but Daggerspell sucked me in and left me obsessed with knowing what happened next. When I found them all on Kindle I read them back to back for about six months solid. Another up-all-nighter, this one is still full of suspense no matter how many times I read it. It’s one of those stories where you kid yourself that if you read it quietly and sneakily enough, the book might not notice you’re reading it and the ending might change. So you have to keep trying. Just to make sure. If you don’t sob your way through a whole pack of tissues the first time you read this, you have no heart. I’m not cheating by mentioning the whole series! The bit that grabs me the most with this is actually the transition between the end of Catching Fire and the beginning of Mockingjay. Don’t believe me? I almost missed my connection when changing trains at Birmingham New Street because there was a platform alteration, but my nose was so deeply in my Kindle that I didn’t notice ALL the people running up the platform past me! Luckily a kind lady lugging a huge suitcase tapped me on the shoulder to get my attention, otherwise I might still be there today! It had to be, didn’t it? Who hasn’t queued outside a bookstore for half the night then raced home and flung open the front cover? Only to wipe the sleep grittily from your eyes at 5am… and only pause for the most urgent of bathroom breaks…. until you get to the end and collapse in a heap? It was literally a race against time with the final book The Deathly Hallows because the book was due out only a week or two before my eldest daughter was due to be born. I knew I wouldn’t be able to read it in one sitting after she arrived, so I was desperate to finish it before then. Luckily for us both, the book was published on the 19th of July in the UK… and she arrived on Harry Potter’s birthday! What are your favourite books to fall into? 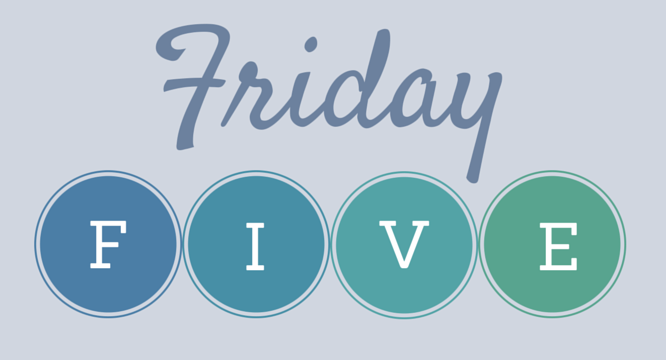 Post a link to your blog below in the comments if you post your own Friday Five – I’d love to see what everyone else comes up with! ‹ Are we too hard on those upset by the death of public figures?